The ninth web-based seminar of the European Rewilding Network took place on December 14th. This time, attendants active in various rewilding sites throughout Europe shared experiences in restoring natural grazing as a key ecological process by bringing back free roaming and wild-living large herbivores. The event focused in particular on horses and bovines, including the Tauros. Second generation crossbreed bull, Tauros breeding site run by The Taurus Foundation, Keent Nature Reserve, the Netherlands. The webinar specifically addressed the importance of natural grazing, being for centuries a key process in shaping European landscapes. Much of the previous aggregation of herbivores is nowadays missing due to great changes in land use, while some of them were brought to the brink of extinction because of persecution. Although views differ about their former numbers, these animals had their own distinct effect on the environment through their foraging behaviour and therefore structure of the vegetation – from open grasslands to grazed forests. Trampling hooves opened up soils, trees and shrubs were browsed upon, and animal’s coats and faeces dispersed plant seeds. With free ranging herbivores disappearing from the scene and livestock farming gaining weight, areas changed in appearance. Heavy farming led to disappearance of variety and dynamics. With the ongoing trend of land abandonment in many regions in Europe, understanding and appreciation of natural processes including natural grazing for increasing biodiversity is rising. Therefore, interest is growing to bring back large herbivores in European landscapes. Rewilding Europe has already set up natural grazing pilots with large herbivores in different rewilding areas and is inspiring others to start similar initiatives. 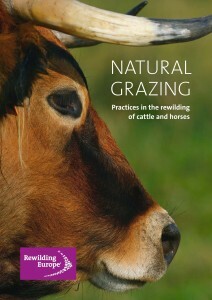 To promote this and share experiences and practices, Rewilding Europe published a manual called ‘Natural grazing – practices in the rewilding of cattle and horses’ in 2015. 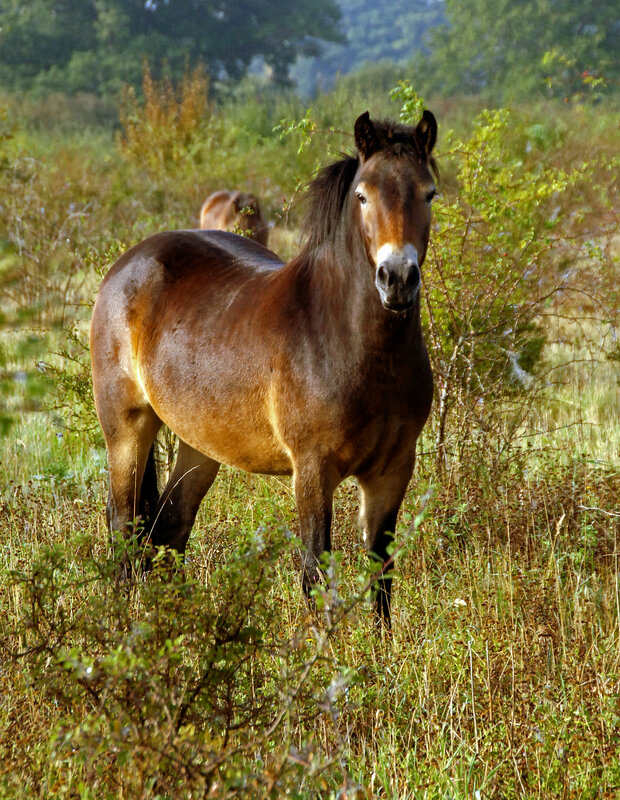 In addition, the publication called ‘Rewilding horses in Europe’ in 2014 provides useful information on the selection of horse breeds suitable for rewilding in different European regions. During the ERN webinar, attendants shared their aims and background to start natural grazing projects with free ranging horses and bovines. Two presenters shared best-case examples and practices, providing a hands-on insight to the participants to help them move forward. 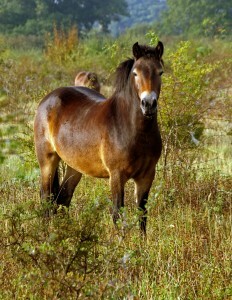 Exmoor pony at Knepp Wildland, West-Sussex, United Kingdom. Firstly, Charlie Burrell, owner and a trustee of British Knepp Castle Estate located in West-Sussex, spoke about his pioneering work at the estate. Fifteen years ago, restoration of natural processes that included natural grazing replaced land management on this former farm. Charlie showed that the presence of Exmoor ponies, longhorn cattle and others considerably changed the landscape transforming it into a biodiversity rich area, with an abundance of bird species. What was once a biological desert has been converted into an ungulates-driven landscape full of variety and vegetation structure. Financial sustainability of the site comes from the sales of certified cattle meat and tourism offers of safaris and tented camps. Today, the site is a renowned example clearly showing results of shifting from a traditional, economically challenging approach, towards a natural setting. 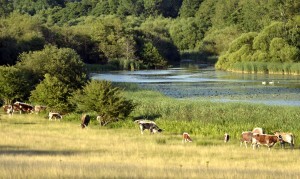 Knepp Wildland is a member of the European Rewilding Network. Next, Ronald Goderie, Director of the Taurus Foundation based in the Netherlands, presented the Tauros Programme, which started in 2008. Before, he has been involved in natural grazing projects with bovines and horses for many years. 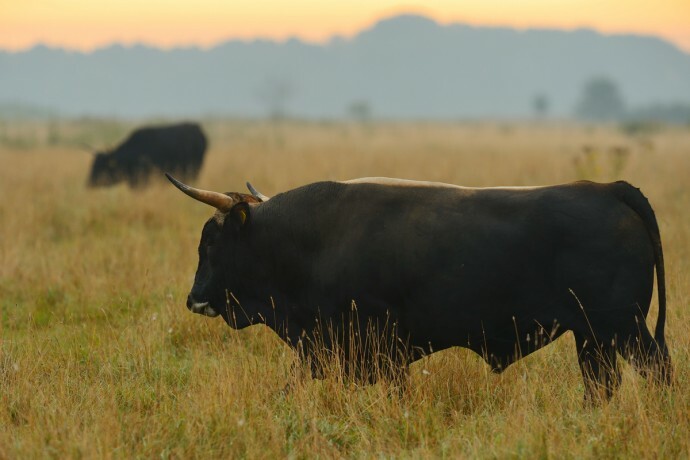 Rewilding Europe and the Taurus Foundation are working together with the common goal to restore natural grazing as a key process in Europe through a breeding programme aiming to bring back a functional, wild version of the aurochs. Using the closest relatives to the original aurochs the aim is to build up viable wild populations of this impressive animal in several locations in Europe, to take their important role as natural grazers in European landscapes. Together with other key partners, Rewilding Europe and the Taurus Foundation published the impressive book ‘The Aurochs – born to be wild’. Free ranging Longhorn cattle grazing at Knepp Wildland, West-Sussex, United Kingdom. The webinar highlighted details on natural behaviour of Tauros indicating its advantages for natural grazing purposes. Besides being a keystone species enhancing biodiversity, the Tauros is becoming a hardy, self-sufficient animal that can cope with conditions of various regions. Ronald spoke about the recent start of a new breeding station combined with natural grazing in the Danube Delta rewilding area in Romania. There, farmers have understood the potential of having Tauros herds, their effect on the ecosystem, potential interest from tourism and the possible revenues of selling meat from out-selected animals. A vivid discussion followed the presentations addressing practical herd-handling issues and rising interest of people to visit rewilding locations with the presence of large herbivores. Overall, it seems there is a need for many more best practice examples as there is much interest to bring back large herbivores into European landscapes. This webinar was the fifth and last one to take place this year. During 2015, no less than 45 unique participants from over 25 rewilding sites located all over Europe attended the subject specific member events. Participants originated from from thirteen countries – from Latvia to Portugal, and from Scotland to Bulgaria. To date, the European Rewilding Network counts 42 members from 18 countries throughout Europe. This year, with new members joining, the network grew further and added over 200,000 hectares. Rewilding Europe warmly welcomes new members to the European Rewilding Network, as we believe that exchanging knowledge on rewilding will be useful for all of us working to make Europe a wilder place. Please feel welcome to have a look at how your inspiring rewilding initiative could become part of this growing network at www.rewildingeurope.com/rewilding-network/.